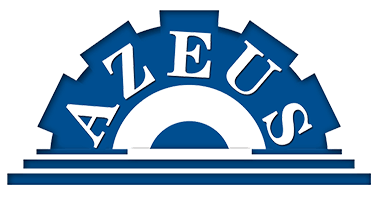 Feed refers to various substances that could be absorbed, digested, and used by aquaculture animals. It has two aspects of the role, one is to provide essential nutrients for aquaculture animals, or is the material basis for aquaculture animals to survive; the other one is to improve aquaculture animal’s resistance to disease, promote digestion, absorption and metabolism of nutrients, improve feed conversion efficiency and aquaculture benefits of aquaculture animals, loss of feed nutrients during storage and processing, control product quality. In addition, breeding aquatic animals with single raw material or non full price mixed feed, due to the lack of feed nutrients or balance, it can not adapt to the physiological requirements of aquaculture animal body metabolism or the formation of tissue components, resulting in low feed conversion ratio, high feed coefficient, then reducing the breeding efficiency. Aquaculture fish feed includes natural food and artificial feed, and feed includes raw material and all kinds of industrial feed from processing, like additive premix and full price made feed. The so-called fish feed is based on the nutritional needs of fish, a variety of raw materials by a certain percentage of uniform mixing, processed into a certain shape of the feed products. Formulated scientific and rational, nutrition comprehensive, fully in line with the growth needs of the fish feed, this is full price made feed. In order to meet the different nutritional requirements of fish at different stages, a growing number of fish farmers start to make fish feed instead of purchasing fish feed on market. For example, making floating fish feed in Kenya has rapidly increased in recent years and little production can not keep up with the fast demand of fish farming. In accordance with the form of feed, it can be divided into powder feed, dough-like feed, broken granular feed, biscuit-like feed, granular feed, and micro-feed. Granulated feed can be divided into four kinds, such as hard pellet feed, soft pellet feed, expanded pellet and micro pellet feed in accordance with water content and density. 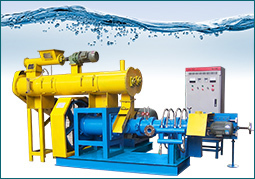 In accordance with the ups and downs of feed in the water can be divided into floating feed, semi floating and sinking feed feed. According to the nutritional components of feed can be divided into full price feed, concentrated feed, premix feed additives and additives feed. In accordance with the culture object can be divided into fish fry feed, adult fish feed, and fish feed. 1.Powder feed: powder feed is to smash raw materials to a certain extent, then mixing evenly. Because the different water content, there are four shapes of powder, pate, minced, and dough. 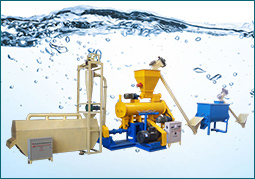 Powder feed is suitable for fish fry, little fish and fish feeding on plankton. After adding feed adhesives, starch and oil spray, powdered feed can be pressed knead doughy or minced, which is suitable for eel, shrimp, crab, soft shelled turtle and other rare carnivorous fish. Hard pellet feed: the moisture content of molded feed was less than 13%, the particle density was greater than 1.3 g /m3, this is sinking fish feed. Steam conditioning is above 80℃, diameter of 1 ~ 8mm, the length is 1~2 times than diameter. It is suitable for salmon, trout, carp, crucian carp, black carp, bream, tilapia, grass carp, etc. 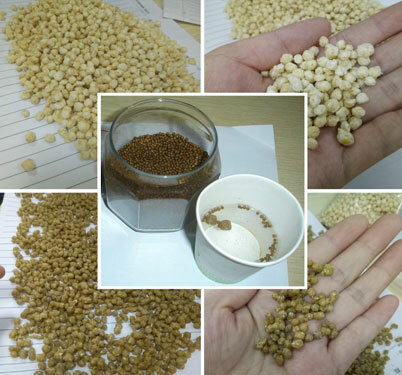 Soft pellet feed: forming feed moisture content is 20% ~ 30%, particle density of 1 ~ 1.3 g /cm3, diameter of 1 ~ 8 mm, shapes of noodles or granular feed. In the molding process is without steam, but need to add 40% ~ 50% of water, then dry dehydration after forming. The existing variety of China’s aquaculture, especially herbivorous and carnivorous or omnivorous carnivorous fish like to eat this kind of feed, such as grass carp, eel; carp and perch. The disadvantage is large water content, easy mildew deterioration, cannot storage and transportation. But it can be made by self, make it when use. Micro pellet feed: micro pellet feed diameter below 500 microns, they are often used as substitutes for plankton, called artificial plankton. Rearing the newly hatched larvae, crabs and shellfish. Expanded pellet feed: after forming, the moisture content is less than hard pellet feed, the particle density is about 0.6 g /cm3, which is the floating fish feed. It can float on the surface of the water 12 to 24 hours without dissolution, loss little nutrient, it can also directly observe the fish eating situation, accurately grasp the feeding amount, so the feed utilization rate is higher. In Japan it is mainly used for raising fish, lion fish and sea bream kam. It can also be used for tilapia, catfish, shrimps, crab, cat, dog and etc. 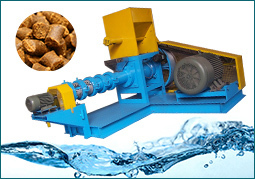 In aquafeed pellet production, two types of aquafeed processing technology are widely employed in the market: extruded aquafeed and pelleted feed. By comparison, pellets made by extrusion own more advantages than that of pelleting. 1.Meet the nutritional needs of farmed fish: the primary principle of designing feed formula is that it must be based on the nutritional needs and nutritional value of fish. Due to the different breeds, age, weight, habits, physiological status and water quality environment, the requirement of various nutrients and quality requirements are different, formula must first meet the requirements of fish feed energy, to maintain the best proportion of protein and energy. Second, we must focus on content ratio of feed protein and amino acid, so that it meets the nutritional standards. The last is to consider the characteristics of the digestive tract of fish, because the fish digestive tract is simple and primitive, it is difficult to digest and absorb the crude fiber, crude fiber must be controlled to the minimum range, general control in 3% ~ 17%, sugar control in 20% ~ 45%. 2.Focus on palatability and digestibility: according to the digestive physiological characteristics, feeding habits and hobbies, appropriate feed was selected for different fish. Such as blood meal protein containing up to 83.3%, but only 19.3% is digestible protein; meat and bone meal protein was only 48.6%, but because of the digestion rate was 75%, digestible protein was 36.5%, twice as high blood meal powder. And as the palatability of rapeseed cake is poor, may lead to inadequate food intake, resulting in waste of feed. 3.Balanced the protein and amino acids in formulation: it must select a variety of raw materials, draw on the strong points of others to make up for ones own weak points, to achieve nutritional standards. 4.Reduce the cost of raw materials: in addition to considering the nutritional characteristics of the selected materials, but also considering economic factors, suit one measures to local conditions, to achieve maximum economic benefits. In order to minimize the cost of input, floating catfish feed pellet production in Nigeria has become the mainstay for fish farmers. 5.Use appropriate additives: the main raw material of self-made feed is animal raw materials and plant materials, in order to improve the nutrition and the feed efficiency, we also need to consider the mixed vitamin and inorganic salt, mixed colorants, attractants, adhesives and other additives. Tilapia Feed Formulation and Feeding Technique-Different fish feed formulations can be made to satisfy Tilapia demands in different growth periods. Fish feeding should keep the rules: fixed time, fixed place, fixed quality and fixed quantity, and also consider four factors: season, weather, water, and so on.